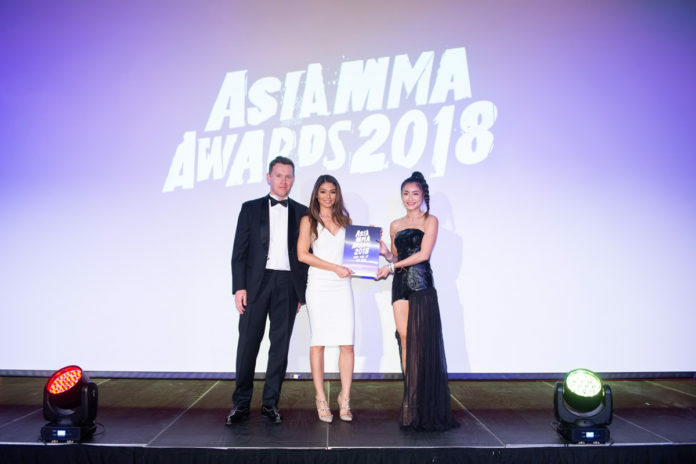 The inaugural Asia MMA Awards was held over this past weekend in Hong Kong. The black-tie dinner, organized by The Fight Nation, took place at the Qube at PMQ featuring a total of 17 nominations. Filipino-Australian Red Dela Cruz participated in the “2018 Ring Girl of the Year” poll, contesting against four other nominees. In order to elect the winner, a few months ahead of the award ceremony, the fans from around the world have voted for their favorites. The winner of the first UFC Octagon Girl Search in Asia, Red Dela Cruz has taken the top spot. As a result, she has become the first Ring Girl of the Year at the first Asia MMA Awards. On return to Australia Dela Cruz told FIGHTMAG that being recognized as the number one ring girl in the region was “the best feeling ever”. She thanked her fans for the support “till the end”. “Thank you to my fans, to my UFC family. Sir Dana White our President, UFC’s vice president Asia Pacific Sir Kevin Chang and UFC events and partnership activation director Asia Ms Leanne Chu, for the support that you have all given me from day one I became part of the UFC, the biggest MMA organisation in the world. I am so grateful and blessed”. Talking her recent travel to Hong Kong Dela Cruz said it “was a great honour to be invited to the first Asia MMA Awards”. Sydney-based Red Dela Cruz is scheduled for her next appearance as the UFC Octagon Girl at Fight Night 141 held on November 25 (AWST) in Beijing. On December 2 she visits South Australia where Tai Tuivasa faces Junior dos Santos in the headliner of UFC Adelaide.